The cool, rainy spring that we had here in paradise has allowed the early blooming perennials to last much longer than usual, much to my delight. We planted about 85% of them the first summer after we moved here so this will be their third full growing season. Every one of them has matured beautifully and they're a delight to behold. Won't you join me in my Sunday morning stroll? In addition to the flowering gardens, one of the best things about this time of year and until mid October is that our local Farmers' and Traders' Market is in full swing. Every Saturday morning Mr. Painted Quilt, Ollie and I head to town bright and early while it's still cool and everything is as fresh as can be. I forgot to bring my camera yesterday but we managed to come home with lots of goodies including freshly picked strawberries from a local farm, a crusty olive bread, a pound of the best scallops in the world caught locally in the Bay of Fundy and some green and yellow beans. Here's all that's left of the strawberry rhubarb pie that I baked yesterday afternoon. Yup, it was that good! Do you think that there will be any left by the time dinner time rolls around? So what do you think? Aren't they so cool? Google reader is shutting down at the end of the month so if you have been following me there, this is just to inform you that you can now follow me on Bloglovin'. In order to do so, I have to claim this blog as mine, hence this post. If you'd like to be notified when I write a new post, just click on the link below or on the Bloglovin' button on my sidebar. 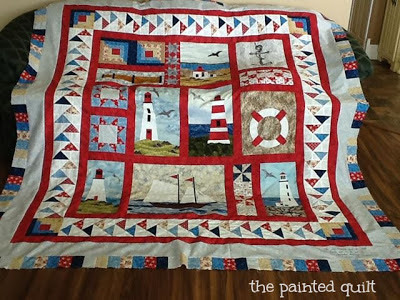 Safe Harbor is now on it's way to my friend Alice to be quilted. I am so excited and hope that I can keep my impatience in check while waiting for it to be returned. As mentioned previously, I am going to try to have the pattern packet for sale as soon as I can. I have to wait until it is quilted and returned to me in order to be able to take the necessary photographs to be included in with the instructions and line drawings. Many of you have expressed interest in purchasing the pattern and I promise to let you know the minute it's ready. Initially I had my heart set on a Bernina 550QE but after waiting over four weeks for delivery, we decided to cancel the order. When I received my clean bill of health a short while ago, Mr. Painted Quilt made the executive decision that we needed to celebrate and now this BIG gal...the 750QE...has taken up residence in my studio. It goes without saying that I'm thrilled beyond words. When my new "best friend" arrived a few days ago, some things just had to change. I still wanted to keep my 1080 as a back up so I had some major rearranging to do in my studio. And after. And here's BIG Bernie! We moved the Hoosier into another room which freed up a lot of space. And here's the rest of the room with my 1080 corner and cutting table. Did you notice my new steamer/presser? This is another new and wonderful addition to my studio. I use it to give the final press to my pieced blocks and the difference is amazing. After pressing, the seams become as flat as a pancake and the size of the block remains unchanged. The top to my nautical quilt is almost complete. I still need to add two additional borders...another small red one and the outermost one which will be more detailed. When finished, it will measure approximately 90" x 82". I am hoping to release the pattern for Safe Harbor in the next month or so. Thank you all for your input in selecting the name and as soon as the pattern packet is available, I'll be announcing the winners of my giveaways. 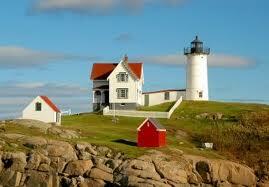 Safe Harbor was the overwhelming choice for the title. I do think that summer has finally arrived here in the beautiful Annapolis Valley of Nova Scotia but it seems like it sure took a long time to get here. For my friends in the Southern hemisphere, you'll have lots of time to to complete this design before your summer arrives. My gift to you this month is this Summer Sampler. To download the PDF file which includes the instructions and line drawing, please click here. Have fun, be safe and enjoy those lazy, hazy, crazy days of summer. Late Friday afternoon I heard from my doctor's office. She was away but had her nurse assistant give me a call to say that even though the reports from the three CT scans were long and involved, they all showed that everything was fine. Most importantly, the scan of the area where the cancer was found "showed no change". Those were the sweetest words I think I've ever heard. Both Mr. Painted Quilt and I breathed many sighs of relief and I felt like I'd been given a new lease on life...until the time for the next scan rolls around. I'll be finding that out after I meet with my oncologist on the 17th of this month. Thank you all for your thoughts, prayers and encouragement during what has been an incredibly stressful month. I know and feel in my heart that they all played a huge part in the results. 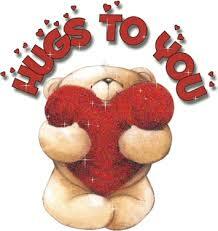 GIANT hugs to all of you! 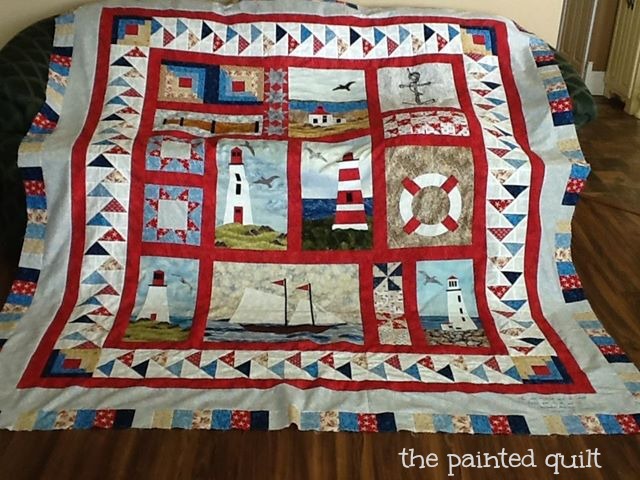 Thank you as well for all the wonderful suggestions for the title of my new nautical quilt design. I'm still working away at it and hope to have it completed by the end of this week and then I'll send it off to be quilted. I've narrowed it down to the following titles so once again, I'm asking for your help with the final selection. This time, not only will I give a copy of the pattern to the person(s) who suggested the name but I'll also do a random draw from all of you who picked the winning title. Although it's dull and overcast here in paradise, the sun is shining in my heart. A short while ago Ollie and I did a walk about in our gardens and we'd like to share them with you. The rhubarb is huge already and after a bit more weeding, the tomato plants will go in tomorrow. Have a wonderful week and don't forget to come back on Friday because this Friday, the 7th, will be the First Friday of the month and my FFF...or First Friday Freebie...is all done and ready to share with you all! It's that time again...the 1st of the month. Row 3 of my Happy Scrappy Spring BOM/ROM is ready for you to download. What was I thinking when I designed this because there are five stitcheries in this row! Don't feel overwhelmed. You'll get them done...if not this month, then next. You'll get caught up in no time because after this month, it's a piece of cake! To download the PDF file please click HERE.